When friends come to town, I am always looking for a unique place to start the day; and three million hand stacked bottles of sparkling wine in a 2-1/2 mile cave is an excellent choice. Last Saturday was my second time at Schramsberg Vineyards. About 3-1/2 years ago, before I lived in the Napa Valley, I took the tour with some friends and was amazed at Schramsberg’s process of wine making – Méthode Champenoise. I had been waiting to take some special friends to experience this tour. I found out one of my best friends was coming to visit, and I decided this was the perfect starting point for our ‘tasting Saturday’. 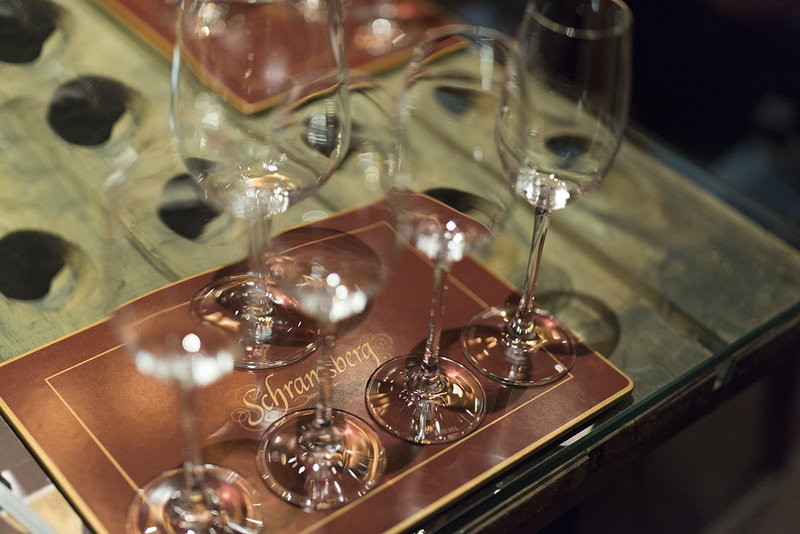 Getting into Schramsberg isn’t easy, especially during harvest season. I booked the tour two months in advance, which I recommend doing most times of the year. Traveling up the pastoral drive toward the entrance, forest on the left, olive groves on the right, we parked the car and strolled down the path past the koi pond entering the lobby. Casey, our wine educator, promptly began our tour with a little history about the winery. In 1862, Jacob and Annie Schram purchased 200+ acres on Diamond Mountain to start what would be one of the first wineries in Napa Valley. Being German immigrants, they planted European varietals such as Riesling and Zinfandel and aptly named the wine Schramsberger. Jacob started exporting his wine to Europe, which became very lucrative. Saving up enough money, Jacob and Annie began construction on a new Victorian home on the property, which still stands today. Jacob found a San Francisco shipbuilder to work on the home, and the residence was built ‘dovetail’ style with no metal nails, only wooden dowels. In 1875 the house was completed, and by 1880 the property was producing over 8000 cases of wine. By 1905 both Jacob and his wife had passed, and their son Herman inherited the winery. But by 1913 the winery was forced to close its doors, and the whole Diamond Mountain area was abandoned due to phylloxera and prohibition. In 1965, the Davies family bought the Schramsberg property and moved their family from Los Angeles to the Napa Valley to start making sparkling wine. They purchased the 200+ acres and in 1967 released a vintage Blanc de Blanc under the name Schramsberg Vineyards. Now run by their son Hugh Davies, Schramsberg produces over 90 thousand cases of sparkling wine a year as well as Cabernet Sauvignon and Pinot Noir under the J. Davies label. 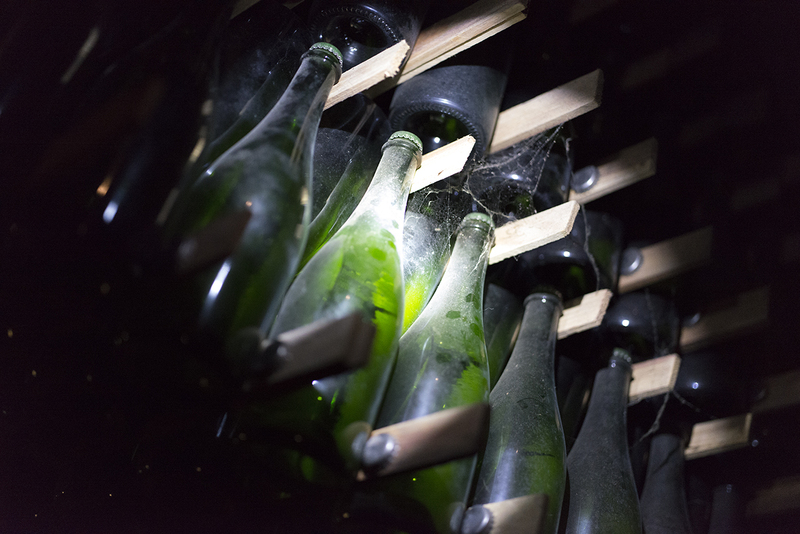 Stored in the 2-1/2 mile cave system some 30 feet under Diamond Mountian, resides Schramsberg’s sparkling wine, fermenting for years in traditional French style. It took nearly ten years for Jacob Schram to dig out 1/2 mile of hillside caves, for wine storage. Using Chinese workers from the trans-continental railway, dynamite, and hand tools, workers toiled daily, and the scars of their pick axes still line the rock walls. Interestingly enough, it only took the Davies less than a year to carve out another two miles of caves with a rented boring machine. Entering this vast cave was overwhelming, I could smell the history as I walked down the corridors. Hundreds of thousands of bottles stacked from floor to ceiling, cobwebs, and dust covering each one, sitting for two years, some as long as 14 years. The temperature was 58 degrees, but the 80% humidity made it feel comfortable. We were about to learn the process of Méthode Champenoise. Dusty bottles of Blanc de Blanc going through 2nd fermentation for two years. Méthode Champenoise allows the 2nd fermentation to take place in the bottle. At 1st fermentation, the juice goes into French oak and stainless steel containers, adding yeast to begin fermentation. 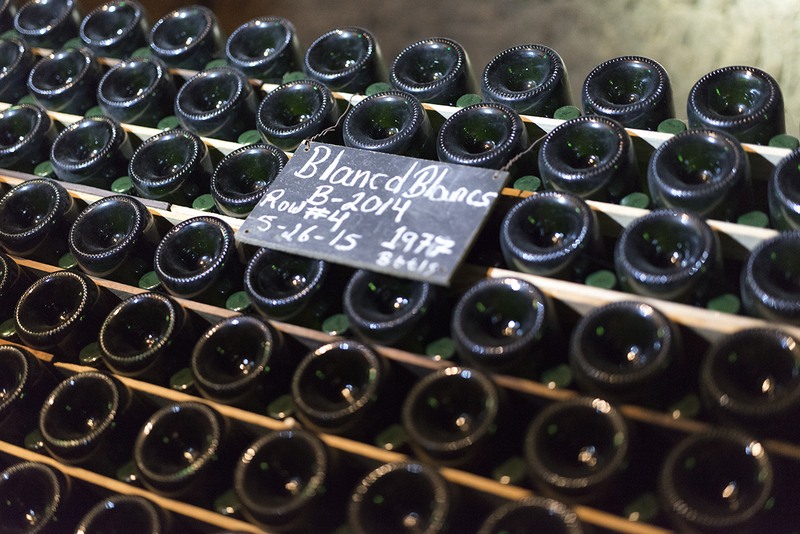 After about three weeks, the fermented juice is put into new champagne bottles with more yeast and added sugar. The bottles are capped with small plastic corks and a colored caps, each color representing the cuveé or type of sparkling wine. This process is called ‘tirage’ bottling. 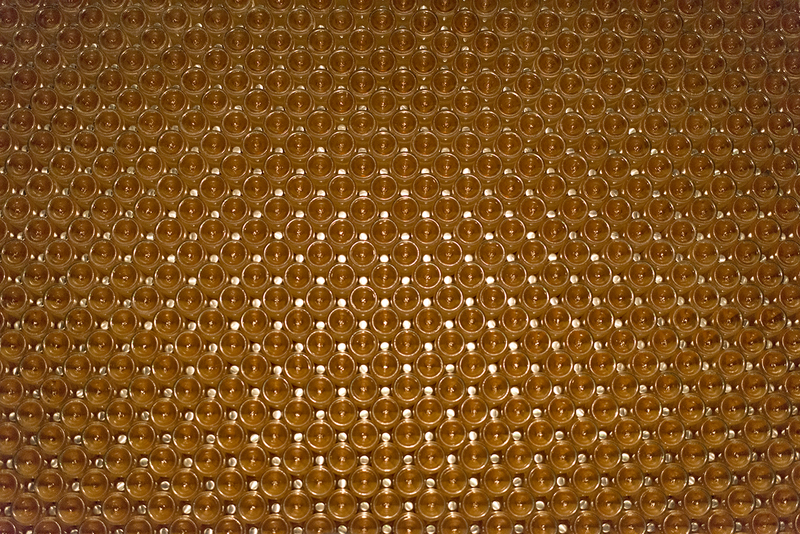 The yeast gobbles up the sugars under 105 pounds of pressure, creating tiny bubbles. The mark of a good champagne or sparkling wine is the size of the bubble because “The bigger the bubble, the more the trouble.” All three million bottles are hand stacked in the cave for 2-14 years depending on the wine. 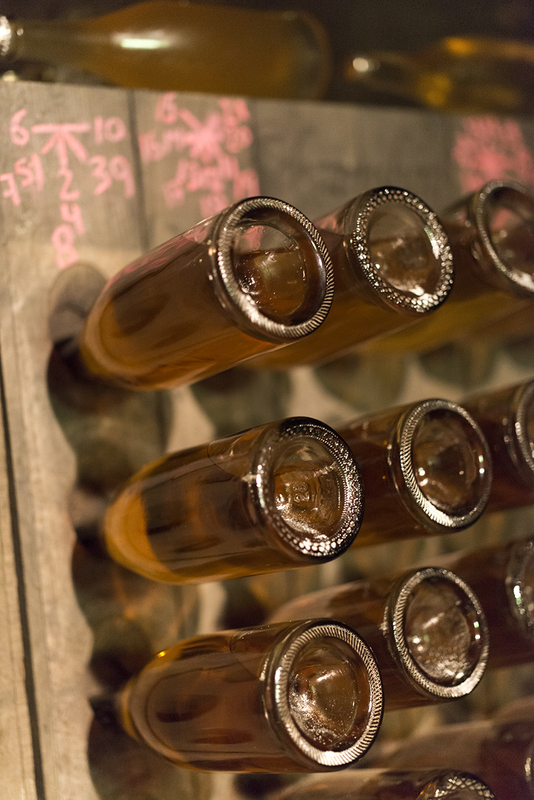 After the sitting period, all the yeast sediment or ‘lees’ collects at the bottom of the bottle and the riddling begins. Riddling is the process of rotating champagne or sparkling wine in a riddling rack to collect the lees toward the bottom of the cap where it is removed. Widow Cliquot of Veuve Cliquot, invented this process in 1812, after losing much of the champagne on her cellar floor attempting to remove the lees. This process of hand riddling goes on for about six weeks, a 1/8″ turn each day. One-third of the 90 thousand cases are still hand riddled by a master riddler and his crew. 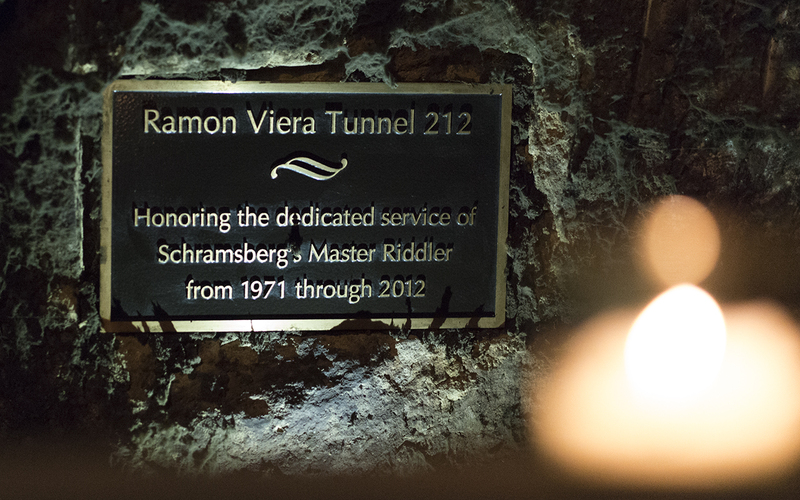 Former master riddler, Ramon Viera, holds the Guinness Book of World Records for fastest riddler. 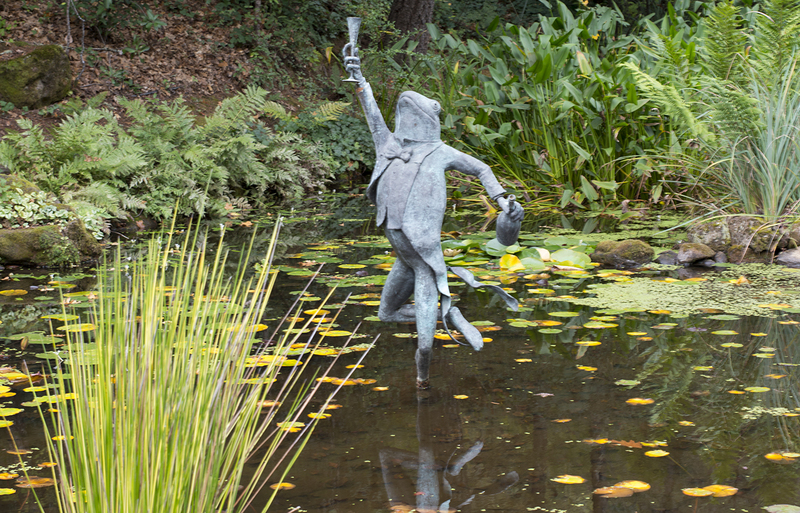 He worked at Schramsberg for forty years and never missed a day of work. After this process, the caps and necks of the bottles are frozen in a negative 70-degree glycol solution and then the cap, lees, and ice is sucked out of the bottle. This process is called disgorging. 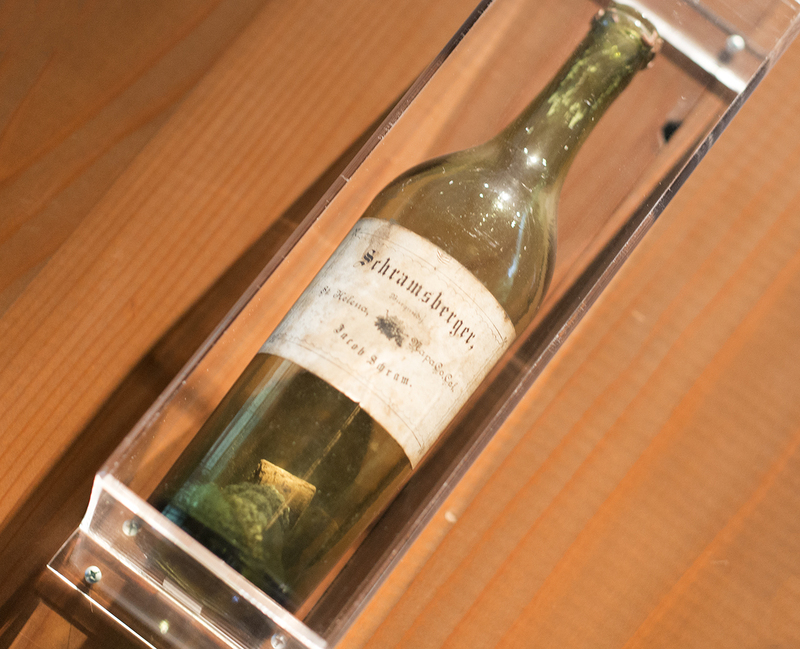 The bottles are then topped off with a ‘dosage’ or premixed wine with sugar, corked, caged, and labeled where they sit for another six months until released. 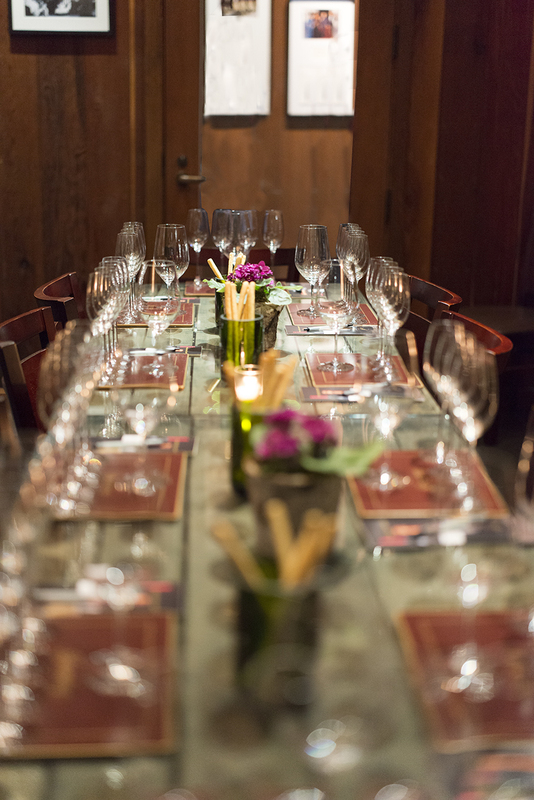 After our comprehensive educational experience on how Schramsberg makes their wines, we headed to our private tasting room with a beautifully-set table made from a few old riddling racks. On the tasting menu was four sparkling wines and one estate Cabernet from the J. Davies collection. Blanc de Blanc is a sparkling wine make from 100% Chardonnay and is forty thousand of the ninety thousand total cases produced. It was the first Chardonnay-based brut sparkling wine produced in the US. The 2013 Blanc de Blanc was beautiful and crisp, light in color with hints of green apple, lemon, citrus and a floral element on the nose. This brut would go well with oysters on the half shell, crab cakes or other shellfish. J. Schram is bottled in a cognac-style bottle and is 84% Chardonnay and 16% Pinot Noir. It has seven years of contact with the yeast, which adds caramelization and a stronger fruit flavor. Hints of Brioche on the nose with stone fruit on the palate followed by pie crust and toasted hazelnut makes this uniquely different from the Blanc de Blanc. It was rich with a long finish, pairing well with a creamy mushroom risotto, alfredo pasta, or pork tenderloin. Schramsberg also makes a J. Schram Late Disgorged with 14 years on the yeast. I didn’t try this wine, but I can imagine the créme brûlée notes and lingering finish it offers. The sparkling wine simply called Reserve had the most body and weight on the palate. Lots of Montmorency cherry and lemon curd presented themselves in this wine that is 76% Pinot Noir and 24% Chardonnay. The viscous nature coated the tongue and finished with a nice creaminess, toasted almond, and English toffee and would be another excellent choice to pair with shellfish. 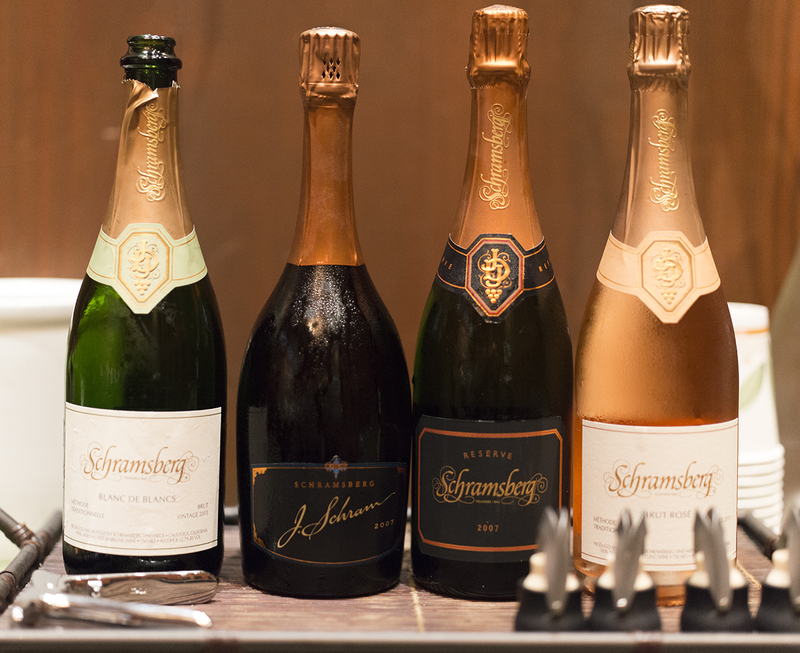 The Reserve is 3% of Schramsberg’s annual production and is aged seven years, using only the finest lots of fruit. A 2000 Late Disgorged Reserve was also made, aged 14 years and would be a lovely, complex sparkling wine. Rosé is created by using Pinot Noir grapes and leaving the skins on for a very short time, giving it a pink, cranberry or even peach hue. The Schramsberg Rosé is a nice fruitful yet dry rosé with hints of tangerine, raspberry, and white peach. It had a juicy acidity that would go well with smoked salmon, fried chicken or raspberry sorbet. This sparkling wine is 60% Pinot Noir and 40% Chardonnay. Small lots of Pinot grapes are fermented with the skins on giving it that luscious color. Rosé is usually my favorite sparkling wine, and this was no exception. It’s a versatile wine that is great with food or by itself. This estate Cabernet exuded notes of black cherry and blueberry as well as vanilla. The tannins were smooth and the long finish incorporated cocoa, chocolate, and spices. This Cabernet is the 13th vintage, with all fruit coming from the Diamond Mountain estate planted in 1994. The wine is 85% Cabernet Sauvignon, 11% Malbec and 4% Petite Verdot all grown at higher elevations. I think everyone enjoyed the cave tour and the wine tasting, and I immediately joined the wine club. I think the mention of sparkling wines and two-pound lobsters at a wine club party sold me. I highly recommend this experience to anyone interested in learning more about Napa Valley history, sparkling winemaking and of course seeing three million bottles in a cave. Next Post Yao Family Wines in St. Helena – It’s Not Just a Name.